­­Born in 1970, Rachel Mann grew up in Worcestershire before studying Philosophy at university. In the mid-nineties, whilst working on a PhD, she was Teaching Fellow in the Philosophy Department at Lancaster before a sense of vocation led to a move to inner-city Manchester in church-related community work. She’s been based in and around Manchester pretty much ever since. In addition to her philosophy training, she holds qualifications in Theology, Creative Writing, and English Literature, including a PhD on Nineteenth-Century Women's Poetry and the Bible. She began writing poetry, liturgy and short stories in the late nineties as a result of major ill-health. She has also written feminist liturgical theology, cultural history and has been a regular contributor to The Church Times. She has published five full-length books, including Dazzling Darkness (Wild Goose) and Fierce Imaginings (D.L.T. ), as well as contributing to many others. In addition she writes on music, particularly prog, folk and metal. She was Metal/Rock reviewer for manchestermusic.co.uk. She works freelance for magazines like Prog Magazine and The Quietus. Ordained into the Church of England in 2005, Rachel is Rector of St Nicholas Burnage. 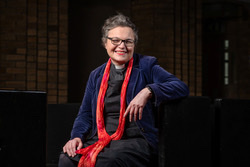 Between October 2009 and September 2017 she was Poet-in-Residence and Minor Canon at Manchester Cathedral. During this period she acted as lead person for the Cathedral’s International Religious Poetry Competition and also helped establish the annual ‘Manchester Sermon’, a collaboration between Manchester Literature Festival and the Cathedral. Appointed an Honorary Canon of Manchester Cathedral in 2017, her poetry has been widely published. Some of her poems are to be published by Carcanet Press in April 2018 as part of the New Poetries VII anthology.